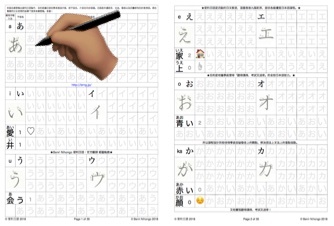 Kana (Japanese Alphabet) Copybook PDF is free to download. The purpose of this Japanese Kana Copybook (Printable!) is to let beginners memorize the Kana (the Japanese Alphabet, namely Hiragana and Katakana) through handwriting. The latest version is 2018. Jumbo and Standard Edition are ready and could be FREE to download on this webpage.